Until now, medical marijuana patients in Napa were forced to drive to Vallejo or further for their medicine. That’s a very long drive for some seriously ill people. But now they can just head over to 2449 2nd Street between 10 am and 6 pm for first-rate service. But there’s a catch: they’ll need a doctor’s recommendation. So far, Napa only allows medical cannabis dispensaries to operate. (The city isn’t ready to embrace recreational just yet.) Under California medical marijuana law, the state Department of Public Health established a voluntary medical cannabis ID system to issue medical cannabis cards to qualified patients with a doctors recommendation. Many states also accept out-of-state medical marijuana authorizations, so it’s still a great idea to have one! The medical cannabis specialists at NuggMD can help patients who have trouble traveling complete the entire process online, from the relaxation of home. How Do I Qualify to Shop at Harvest? 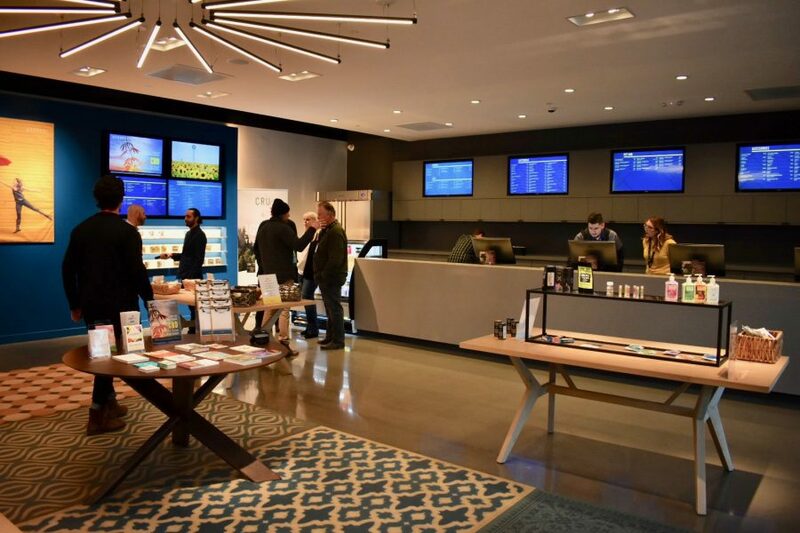 What will patients see when they enter Napa’s first legal dispensary? It’s not tie-dye and seedy green carpet, that’s for sure! Their 1,600 sq ft showroom looks more like an upscale art gallery than a pot shop. Brands like Canndescent and CRU Cannabis are artfully arranged in neat rows under stylish recessed lighting and beautiful back-lit display cases. Choose from products based on THC content, brand and price clearly displayed on the electronic menu screens; or you can see available products ahead of time online. Oak tables are arranged throughout the showroom with pamphlets and other fliers if you want to learn more about available products. Harvest offers tinctures, lotions, edibles, vape cartridges, flower and pre-rolls, so there are plenty of products to choose from, including CBDs! Patients still need an up-to-date doctor’s recommendation or county-issued medical marijuana identification card to buy medical cannabis at Harvest. Thankfully, getting a doctor’s recommendation in California is a piece of cake. According to state law, any condition that the doctor feels could benefit from cannabis use will qualify you, a state resident, for a doctor’s recommendation. Patients 18 or older can get their rec completely online with NuggMD. Simply head over to harvest.nuggmd.com to register online in a matter of minutes. New NuggMD patients will receive an electronic copy of their recommendation that they can print and use the very same day until their permanent rec arrives by mail. Harvest of Napa is a branch of Harvest Health & Recreation Inc., based in Tempe, Arizona. A patient-oriented dispensary, Harvest believes each individual is unique. Their main focus is finding the right product to fit each customer’s distinct needs. This will remain their focus even after Napa finally embraces recreational sales. NuggMD is the nation’s leading telemedicine platform, serving patients in New York, Nevada and California. The online service connects licensed doctors with prospective medical cannabis patients via their state-of-the-art online platform for only $39. They serve patients 18 and over who have any condition that can potentially benefit from cannabis treatment. NuggMD has helped more than half a million patients improve their quality of life with medical marijuana. “It’s our mission to end those gaps in medical cannabis access throughout the state,” says NuggMD CEO Collin Mann. Harvest and NuggMD want to thank the city of Napa for finally putting the patients first. Now they have options for medical cannabis access right here at home.